Imola Part 2: Summers on Spanish TV ? As the seventeenth anniversary of Senna’s death passes ( May 1 ) it seems the great man’s life has been immortalized by a film, released in Europe and the US during the summer. I think the first thing to say is that all the reviews are saying that the film itself is good, enjoyable for Senna fans and people who have never heard of him. Remembering the great motoring films – Grand Prix, Le Mans, Two Lane Blacktop, Vanishing Point – usually the plot/character is dodgy even while the car footage is fantastic. It is exciting if the Senna film truly does carry both specialist and broad appeal, because it means Senna will be accessible to people now and in the future who aren’t Formula 1, or car people. So how should posterity remember Senna ? I feel unusually qualified to comment; you see, Senna, or more precisely the way he drove the black and gold John Player Special Lotus Renault in the summer of 1985, turned me onto motorsports as a 13 year old, and at 21 his passing marked my transition to manhood. As a teenager, on a Sunday morning, if there was a Grand Prix, I would read the paper to learn the grid and practice news, do my homework ( ! ) and then watch the race on Sunday afternoon. I still use the Senna criteria – fastest, feistiest – to decide who to follow in motor sport now. In my twenties, he symbolized a balls out no compromise flat out no fear full throttle approach to life – I’d tell people his influence was stronger than it ever was whilst he was alive. 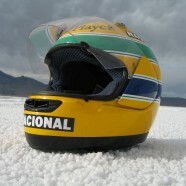 My favourite Senna story concerned the Peralta, in Mexico. It is a long, 180 degree right hander. It was acknowledged to be a 5th gear corner – above 150mph. One year, Senna tried in 6th. He crashed, heavily. The following year, he tried again. That he crashed again isn’t the point. I simply hadn’t ever witnessed that sort of courage, sheer self belief before. At Monaco in 1988 Senna was 1.5 seconds faster than anyone else; in Formula 1 terms, that just as well be a year and a half. As he went faster and faster, Senna later described it as an out of body experience – he was above the car watching it. I didn’t realize until years later was what was going on inside his head. Senna was deeply religious, and I believe he felt his speed was a gift from God – almost like a medieval King, who believed he had the Divine Right to rule, a mandate from God, Senna felt his gift endowed him with a Divine Right to pass, to win. The qualifying format of the 80s/90s showcased the Senna gift most spectacularly; he would wait in the garage until the final seconds of the session, until everyone else had given their best, and then go out and be faster. From somewhere down inside, or perhaps outside, he harnessed the skill to be fastest. 65 times – his ratio of race starts to poles is unmatched. Often, it was the best spectacle of the race weekend. It was completely unlike the clinical Michael Schumacher would be in later years – Senna was turbocharged with passion – Holy Gasoline – he simply had to be on pole. The self belief, the divine right meant that Senna had a will to win unlike anyone else in the sport. He introduced an over-taking technique common in Formula 1 now, where in order to pass, you position your car on the track in such a way that it is up to the other driver to either let you by, or crash into you. “Unsporting” people used to say, but as a teenager I loved it. Twenty years on, watching deliberate crashing, and the “win at all costs even if it is dirty” attitude which is standard practice in F1 now, it is the Michael Schumacher era we blame for the change; infact, these sort of tactics are something MS learned from AS. It is also something for which the sport cannot but be the worse for. After Imola ’94, I remember feeling not so much upset, as conscious it was the end of an era, and that was very sad; also that Senna had always been on a razor edge, and he who lives by the sword…. Perhaps the best postscript is to watch those last few seconds of onboard footage; during practice and qualifying Senna had been deeply affected both by Ratzenberger’s death, and his countryman Barichello’s serious accident. Senna had made a point of advising Damon Hill, his young team mate: stay off the bumps on the inside of Tamburello, since they unsettled the car and could cause it to toboggan off track; yet the onboard footage shows him placing the car right on the bumpy inside line. Eyes open, fully conscious of the danger, up to the end, he was doing everything to achieve the fastest possible line through the corner. It\’s best to participate in a contest for among the finest blogs on the web. I\’ll advocate this web site! Nice website! How did you get that design? This internet site is my inhalation , real superb design and perfect subject matter.